Generally your order takes 24 hours to be dispatched. 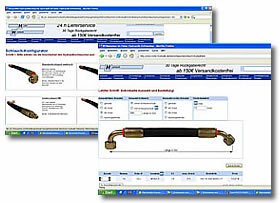 Our Hydraulic hose configurator helps you to choose nominal widht, length, armatures and specialities. Design your own high pressure cleaner hose with the help of our Configurator. 10m 50,15 € (incl. VAT). From 1053,11 €. Furthermore we manufacture all kinds of specials power-units for you. 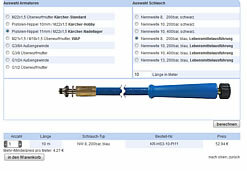 Type HK-A: Sleeve 7,94 €, Plug 3,28 € (incl.VAT.). consists of hose, foam injector, pistol and foam cleaner 150 €. consists of manometer, mini measuring hose, coupling plug,and measuring connection 30 €. consists of 2 sleeves, 2 plugs and dust protection 20 €. Welcome to your Hytec Hydraulic Online Shop for Hydraulics, Pneumatics, High Pressure Cleaning, Agriculture and Technique. 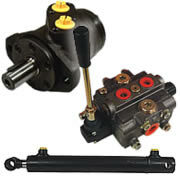 We have a broad range of more than 10.000 hydraulic products and spare parts. It ranges from standard products like hydraulic cylinders, valves, fittings to hydraulic hoses and high pressure cleaner hoses up to self-manufactured hydraulic power units. Our assortment includes brand quality from manufactures like Kränzle, Bosch und Chapel. Furthermore you have the option to design the hydraulic hose you need with the help of our hose configurator and order it in our shop. We are particularly proud of our customer services and the quality of our products. Our competent customer service team will happily advise you if you have any technical questions. Almost all products are always in stock. In general your order will leave our company on the same day you placed your order. Please contact us if your aren't fully satisfied with your goods and we will deal with your query as fast as possible. It is not without reason that our company exists for more than 20 years. Hytec Hydraulic Online Shop offers several payment methods to guarantee maximum comfort and security. You can easily pay via PayPal Express - fast and secure - or by prepayment with 3% cash discount. Customers with an european VAT ID no. or customers from outside the European Union receive an invoice without 19% german vat. Most importantly - if you can not find the product you are looking for please do not hesitate to contact us, by E-Mail (info@hytec-hydraulik.com), or phone (+49 (0) 5351 - 523 520) or by Fax (+49 (0) 800 - 498 326 4). We would like to thank you for the trust you have placed in us and we are happy to help you any time.